This entry was posted in Content and tagged 7th RTR, Commonwealth forces, Matilda Tanks. Bookmark the permalink. Crisp’s “Brazen Chariots” has a reasonably lengthy passage on the futility of shooting on the move, and how the author trained his troop to conduct micro-halts, shoot, then move on again, with the aim of maximising both the defensive advantages of constant movement with the offensive advantages of more accurate shooting. Of course, he was in a Honey, rather than a Matilda, and the Honey had a ‘free’ mount for the main armament. OTOH, the Matilda is heavier, slower, and has a longer “wheelbase” than the Honey, all of which mean that it’d be a much more stable platform to fire from on the move compared to the Honey. I would take it (and naturally in conjunction with the comments of Crisp and McGinlay ) therefore, that shoot-on-the-move tactics were viable for the Matilda in a way that they were not for the Honey. Or, in other words; horses for courses. Spot on about Honey unsuitable for shooting on-the-move. R.D. Lawrence (GREEN TREES BEYOND, pp. 109-10), a tank gunner in 7th Armored Brigade during Crusader, took part in what seems to have been the first heavy metal exchange of the battle – on 18 Nov – upon encountering a small German supply convoy; his first shot, on the move, missed badly. Second, after stopping, flamed a truck and killed people. Minor correction. If he was in 7th Armoured Brigade, he was not in a Honey. 🙂 They were all in 4th Armoured Brigade (he would have been either in 3 RTR, 5 RTR, or 8 Hussars). Yes, that’s what I thought at first: 3rd RTR…..but Lawrence says he took part in a late-in-the-day, 18 November attack on a smallish German supply convoy; according to 7th Armored Brigade Cdr Davy (7th AND THREE ENEMIES, p. 145), this involved elements of 7th Hussars. Just from reading Crisp, it looks like 3rd RTR saw its first action on the 19th (also a convoy attack). I am sure Lawrence would know what kind of tank he was in, so have to admit myself perplexed. Maybe you can decipher his statement as to his unit: “Next we were assigned to units, my own draw being 7th Battalion of the Royal Tank Regiment…”. So which RTR had a 7th Battalion? Only if I don’t have an expert to consult; thanks. Lawrence wrote his memoir during the early 1990s, published ’94…so after 50 years, some events, dates, unit #’s got smudged together in his memory. Putting it all together, looks like he was in 3rd RTR. I just wish I could find something substantial from 7th Armored Brigade, other than Davy’s book, and esp. from 22nd Armored…but so far no luck. Pre-war 2pdr ammo production was almost one million rounds. These were roughly 33% AP Shot and 67% AP Shell. The two rounds were identical except for markings (shot and shell), although I have seen reference to the AP Shell being painted yellow and Shot painted black. 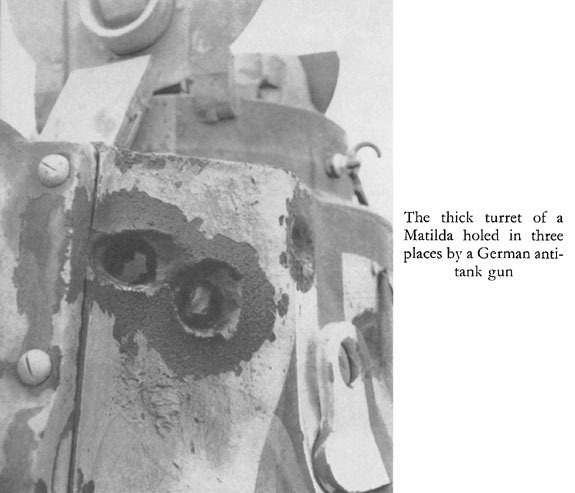 This was in a report about Beda Fomm wher the tank commander noted that the yellow HE rounds were just as effective against M11/39 tanks as the black shot. The bursting charge was small and the lighter weight did decrease penetration, which was something the Germans noted with the PAK 34 37mm gun firing Panzergranate rounds. For this reason, the British removed the bursting charges from their already manufactured AP Shell and replaced it with lead/iron. I know that the cruiser tanks did not want AP Shell due to their belief that their purpose was to fight tanks, but the RTR, when supporting infantry brigades, would have found it useful. I have yet to find any proof that the production of AP Shell was NOT restarted after the 1940 ‘invasion scare’. The later HE ammunition was a different size from the AP SHot/Shell and had different sized stowage racks. In Recce units, a two car patrol had one car with HE and no Littlejohn adapter, while the other car had AP and retained the adapter because of this.